The Benjamin Marauder PCP Synthetic Stock Air Rifle is an upgrade of the original wood stock version of the same gun. Shooters can find this air rifle available in .177”, .22”, and .25” calibers, which one you select will depend on what you prefer to shoot and what you plan on shooting at. The .177” and the .22” caliber air rifles come with a 10-shot repeater, while the .25” caliber has an 8-shot repeater. The air rifle also comes with a built in air pressure gauge, allowing you to easily and quickly check if you need an air refill. When looking for an air rifle for an adult, the last thing you want is some kind of air rifle that is going to fall apart after a few uses. You want to find a high quality one, something that will last for more than a few years. One way to determine the quality of the air rifle is to look at the manufacturer. Most avid shooters know all about the top air rifle manufacturers, they know the product being produced is high quality and they know that the company is going to stand behind their product. They don’t have to worry about false advertising. The Benjamin Marauder PCP Air Rifle is one of those high quality products that you don’t have to worry about. Made by Benjamin, a very well known name in the gun world, experienced shooters can rest assured that the company will stand behind their product. Benjamin is a well respected company in the gun world; they manufacture a lot more than just air rifles. Other products in their line include pellets, and hand pumps. Like many other Benjamin products the Marauder PCP is a very reliable gun, as long as it is being used properly. The choked barrel aids in accuracy, while the 2-stage adjustable metal trigger is not very hard to pull. The lighter trigger pull makes firing time after time easier. The stock is ambidextrous and comes equipped with a vertically adjustable comb. And to make things even better the bolt is reversible, but you must specific if you need it for right or left handed shooters upon check out because it requires special servicing to be moved. When looking at this air rifle you would think that it was heavy and awkward to shoot, but just the opposite is true. It is actually a lot lighter than it looks, weighing in at about 7 pounds. The gun itself is only about 43-inches long making it the perfect length for a variety of shooters. The 215cc air reservoir is also easy to fill as it has a male quick-disconnect fitting. How powerful you want your air rifle to be is really going to depend on how experienced of a shooter you are. Beginning shooters really don’t need that much power, while more experienced shooters often enjoy the challenge presented by a more powerful gun. How powerful the air rifle should be will also depend on what you plan to use it for. Small game hunting is going to require a bit more power than target shooting or pest control. One of the outstanding features of the Benjamin Marauder is that you are in control of just how powerful the air rifle is. Unlike other air rifles out there the Marauder PCP can be adjusted for different velocities. Several people have found that lowering the velocity will also help improve accuracy, so if you are having trouble hitting the target make sure you look into that. The Benjamin Marauder PCP is like most other PCP guns out there and requires air pressure to shoot, but how much air pressure is needed is a different story. Most PCPs require about 3,000 psi air pressures to properly fire. If the air pressure is too low your chances of a misfire are actually higher. However, with the Marauder you can use high pressure air that ranges from as low as 2,000 psi to as high as 3,000 psi. If you are going to change the pressure though you will need follow the instructions for adjusting it that come in the owner’s manual. 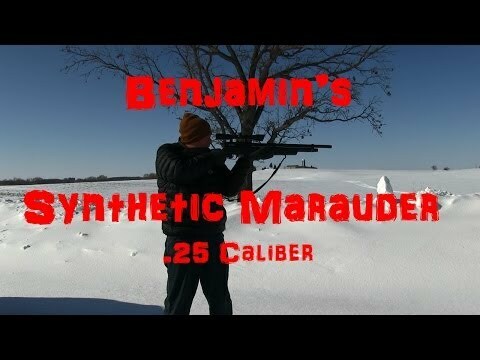 How accurate the Benjamin Marauder PCP is will vary on a few different factors. One of the factors that influence accuracy is how well you can aim the air rifle. If you can’t line up the target then there is no way you are going to be able to hit the target, let alone get good results each time you shoot at the target. Other air rifles come equipped with either a scope or sights to help in sighting the target, but the Benjamin Marauder PCP does not come with either. If you are worried about lining up targets, whether it is a live target or a paper target, you must remember to mount a scope of 11mm dovetail rails. How powerful the air rifle is also plays a role in determining how accurate the rifle is. Too much power and the pellets probably won’t hit their mark, same with not enough power behind the shot. Several tests have been conducted on the air rifle and the best accuracy is achieved at 2,600 psi, but each gun is different. It is highly recommended that you try different fill levels with your own air rifle to determine what workers best for you. However, many shooters report achieving dime sized groupings at 25 yards with only using a front rest and no fine tuning. Price is always a deciding factor when it comes to purchasing an air rifle, but before you look at the price you have to think about everything that you are getting for that price. Value is not just what you pay; it’s what you are paying for what you are getting. With the Marauder sure the price is higher than other air rifles, but you are getting a lot more with this one than the cheaper air rifles. This is not your run of the line beginner’s air rifle. This air rifle is powerful enough to be used for hunting small game, but is also deadly accurate. Even though it is technically an air rifle, it is not what you would consider a toy air rifle. This is the real deal and is worth every penny. If you look at everything that the Benjamin Marauder has to offer you can’t help but be amazed. Not only does this air rifle look good, it also performs quite well.